Locals have sold their art at the Farmers Market for a few years now, but space was limited. The Artist Market will allow many more artists to participate. 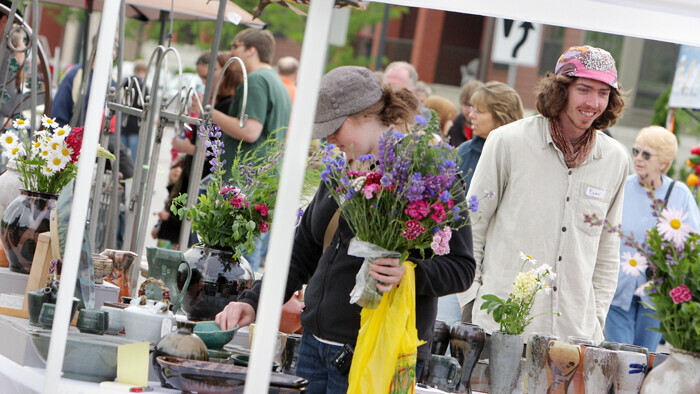 This summer there will be a new Artist Market working in harmony with the ever-popular Saturday morning Eau Claire Farmers Market in Phoenix Park. Erin and Jamie, of Tangled Up in Hue have participated as artists at the Farmer’s Market downtown for several years, and said they always found it a rewarding experience. However, because of the limited amount of space available to artists they were only allowed to set up a booth twice during the span of the farmer’s market season. The duo pulled their connections with other area artists, trying to seek out who else would be interested, and the response was overwhelming. From there, the duo took a petition directly to the customers, asking about their interest in seeing an Artist Market run along side the Farmer’s Market. Though the Artist Market was spearheaded by Tangled Up in Hue, all area artists (within 40 miles of Eau Claire) are invited to participate. Artists can pick and choose the dates they vend, so there will be different artists each weekend. The Artist Market – which will take place the first and third weekend of every month – will be a juried event, with jurors from Tangled Up in Hue, The Art Cartel, and The Chippewa Valley Art Association. Artists may apply by submitting digital copies of their artwork. Cost for participation in $20, which will cover the 10 x 10 booth, marketing and advertising of the event, and the creation of an art scholarship for UW-Eau Claire. Some vendors already signed on include photographer Corey Jevne; water color painter Ruth Lundblad; and metal smith Robert Romanshek. Artist Markets will be held on the first and third Saturdays of each month in conjunction with the Phoenix Park Farmers Market throughout the summer.